Miguel Covarrubias (1904-57) – or, to give his entire name, José Miguel Covarrubias Duclaud – had a multi-faceted career as an artist, art historian, author, and ethnologist. His sketches and caricatures were for years a mainstay in The New Yorker and Vanity Fair, and his stage designs graced productions by the likes of Josephine Baker. Many of his books were inspired by his extensive travels. In his later years, researches into the art and culture of his native Mexico and larger Mesoamerica resulted in one of his most famous books, The Eagle, the Jaguar, and the Serpent: Indian Art of the Americas (1954). With his then-girlfriend Rosa, Covarrubias visited Europe, Africa, and much of North and Central America in the 1920s. After their marriage in 1930, Miguel and Rosa took an extended honeymoon on the island of Bali. 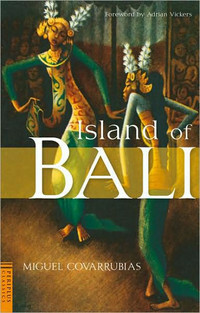 Fascinated by Balinese culture, they returned to the island in 1933 with the help of Miguel’s Guggenheim Fellowship.